World Of Black Heroes is an online directory of Black Heroes of Fiction; T.V., Film, Web, Literary (novels, comic books etc.). Founded in 2010 by Ryan Fraser, a Caribbean born Lecturer, Multidisciplinary specialist & Author. Per the World Of Black Heroes site: World of Black heroes is a website dedicated to following the portrayal of Black heroes; Black here is a term loosely being used to refer to the racial group of humans with dark skin color, to categorize a number of diverse populations into one common group. This list includes African American characters, characters of sub-Saharan African descent, Australian indigenous people, dark skinned Latinos or populations characterized by dark skin color (a definition that also includes certain populations in Oceania, Southeast Asia, southern South Asia, and the southern Middle East). World of Black Heroes will bring you everything on these characters in comics, movies, on TV, books and the people who bring them to ya! NKOSI Publishing is proud to have GLYPHX listed among the many unique Black characters of imagination. Click the image below and learn more about GLYPHX. 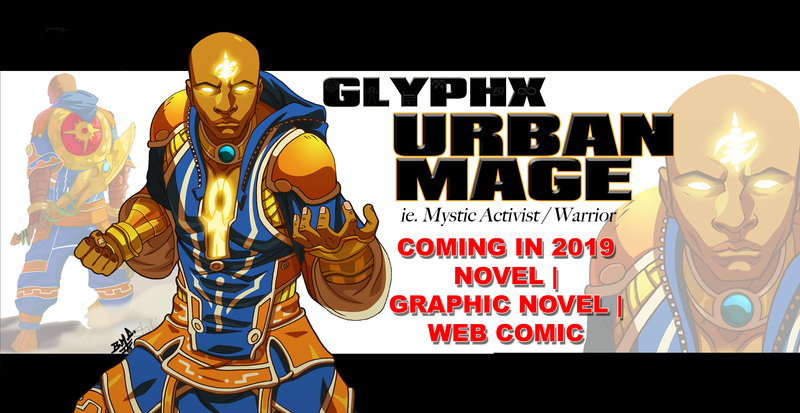 Be sure to check out the complete GLYPHX The URBAN MAGE web-comic, beginning with the Synopsis and then click the arrow to the web-comic. Don’t hesitate to leave comments or critiques!